Posted September 21, 2016 by admin & filed under Skincare. As you age, you may notice an increased presence of flat, brown to dark gray colored spots on your skin. While often referred to as age spots, these collections of pigment (Melanin) aren’t really caused by aging. Instead, they are primarily the result of years of exposure to Ultraviolet Rays. That’s why they tend to show up on areas most often exposed to the sun, such as the face, neck and back of the hands. Also commonly referred to as Solar Lentigines, Hyperpigmentation and Sun Spots, while unsightly, Age Spots are neither painful or dangerous. That said, because they are similar in appearance to cancerous growths, you should take caution not to miss diagnose yourself. If you have spots that are irregularly shaped, tender, itchy or seem to be growing in size you should have them diagnosed by a Dermatologist. People of all ages and skin color develop Age Spots, however those that fit one or more of the following characteristics are most prone to developing them. Frequent UV Exposure … People who spend considerable time in the sun are more likely to develop Age Spots. Over 40 years of Age … Simply because of accumulated exposure to UV Rays over the years. This is partly why they are most often referred to as Age Spots. Fair Skin … Those of us with a fair complexion are more prone to all of the negative effects of UV Exposure, spots on the skin included. Protect Your Skin … Use Sunscreen. If it seems like we mention this in almost every article we write, that’s because we do. Sunscreen is the single most important Anti-Aging product for the skin. Protect your skin from the damaging effects of UV exposure and it goes without saying that you will experience less side effects. Use a sunscreen with Broad Spectrum protection to ensure you are protected from both UVA and UVB Rays. Anti-Oxidant Skincare … Use products with Anti-Oxidants to repair skin damaged by exposure to UV Rays, air pollution, etc. Vitamin C is the best Anti-Oxidant there is for the skin. Find one that is stable and use it daily to help treat and minimize sun damage and many other problematic skin conditions. 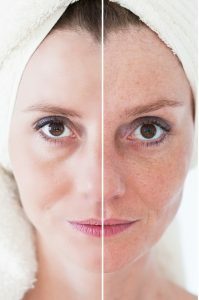 Laser Treatment … Kills Melanin producing cells without damaging the skin. Usually takes multiple treatments over a few months. Chemical Peels … An acid is applied to the skin to burn the outer layers, allowing new skin to replace it. Hydroquinone … Gradually bleaches the skin by inhibiting the production of Melanin. Effects usually become noticeable after 3-4 weeks of regular use. Retinol … Works by speeding up cell turn over and causing them to die rapidly, making way for the growth of new cells. Retinoids are known to cause peeling and redness, especially early on in treatment. Vitamin C … Aside from its Anti-Oxidant benefits, Vitamin C can be an effective skin lightener. Like Hydroquinone, it is thought to inhibit the production of pigment causing Melanin. While some Age Spots are to be expected in our later years, we can both delay and minimize them by protecting and caring for our skin. The extent to which we experience these blemishes as we age is a result of the effort we put into preventing and treating them. Prevention is much preferred over treatment, so if you take nothing else from this article, be sure to use Sunscreen and Vitamin C daily. For more information on this or any other Skincare topic, visit us online or give us a call. We would love to help in any way we can.